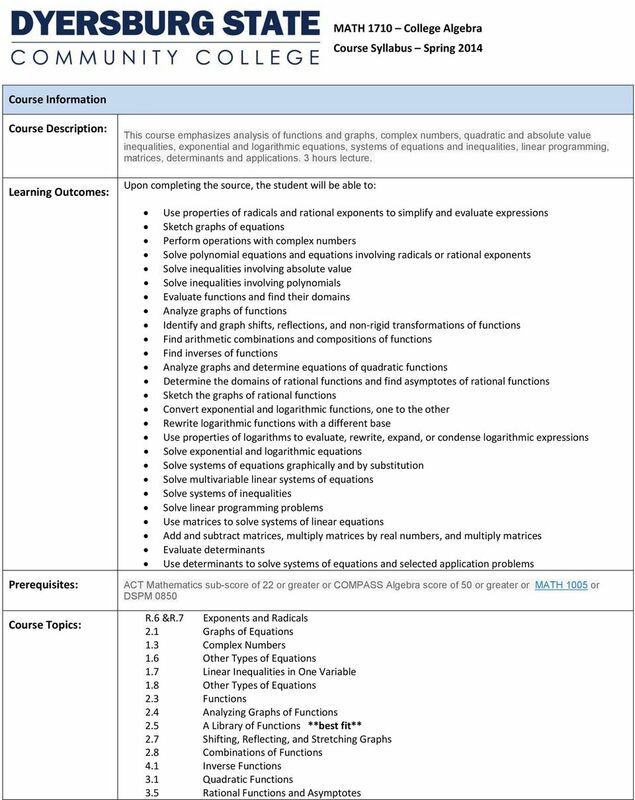 Download "ACT Mathematics sub-score of 22 or greater or COMPASS Algebra score of 50 or greater or MATH 1005 or DSPM 0850"
2 Specific Course Requirements: 3.5 Graphs of Rational Functions 4.2 Exponential Functions and Their Graphs (Evaluation and graph of function) 4.3 Logarithmic Functions and Their Graphs 4.4 Properties of Logarithms 4.5 Exponential and Logarithmic Equations 4.6 Exponential and Logarithmic Models 5.1 Solving Systems of Equations 5.1 Multivariable Linear Systems 5.6 Systems of Inequalities 5.6 Linear Programming 5.2 Matrices and Systems of Equations 5.7 Operations with Matrices 5.7 The Determinant of a Square Matrix 5.3 Applications of Matrices and Determinants Students must learn to navigate MyLabsPlus in order to access their e textbook, lecture videos, quizzes, and tests. Homework may be completed at home, but students are required to take all quizzes and tests in the Math Lab using MyLabsPlus. Students are required to attend class at the assigned time each week and attend lab a minimum of two hours each week, but more hours may be necessary to stay on pace. Math Lab is NOT optional and is considered as class time. You may choose any two hours each week that fit into your schedule. The Math Lab hours for the JNC are the following: Monday: 8:30 AM 6:00 PM Tuesday: 8:30 AM 6:00 PM Wednesday: 8:30 AM 6:00 PM Thursday: 8:30 AM 6:00 PM Friday: 8:30 AM 1:00 PM Each student is required to maintain a binder with dividers containing video/lecture notes, completed homework, and supplemental course materials including syllabus. All materials must be brought to class and lab. A student will be reported as stopped attending if they miss 2 consecutive classes, 3 consecutive hours, or 6 total hours of the required class/lab time. Textbooks, Supplementary Materials, Hardware and Software Requirements Required Textbooks/ Courseware: College Algebra, 11 th Edition, Lial, Hornsby, Schneider, and Daniels Student access to the on line textbook is paid through course fees. Students will NOT need to purchase an access code. (Hard copy text is optional but may be obtained by visiting the DSCC Bookstore at Required Supplementary Materials: Software Requirements: Scientific Calculator: TI 30XIIS or similar model (Graphing calculators are not allowed.) Binder with dividers for maintaining homework and notes. Minimum requirements for the course are as follows: You must have Adobe Acrobat Reader to access notes and handouts sent through D2L. This is a FREE program that can be downloaded. You may want to download Mozilla Firefox in case MyLabsPlus has updated and needs this to access problems. 3 Instructor Information Instructor Name: Instructor Contact Information: Office Hours/Virtual Office Hours: Instructor Response Time: Associated Professor, Stephen M. Son Office: 157 (in Math Building: DSCC campus) Phone: E mail: To access your instructor s information online: Visit 1. Click Current Students on the top navigation bar. 2. Click Faculty Profile link located on the left hand navigation bar. 3. Choose your instructor s name from the drop down list. 4. Click the Submit button. To access your instructor s information online: Visit 1. Click Current Students on the top navigation bar. 2. Click Faculty Profile link located on the left hand navigation bar. 3. Choose your instructor s name from the drop down list. 4. Click the Submit button. I will make every attempt to respond to course within 24 or 36 hours during the work week, though it may not be possible in all cases. I will notify you when I will not be able to meet the stated response time. 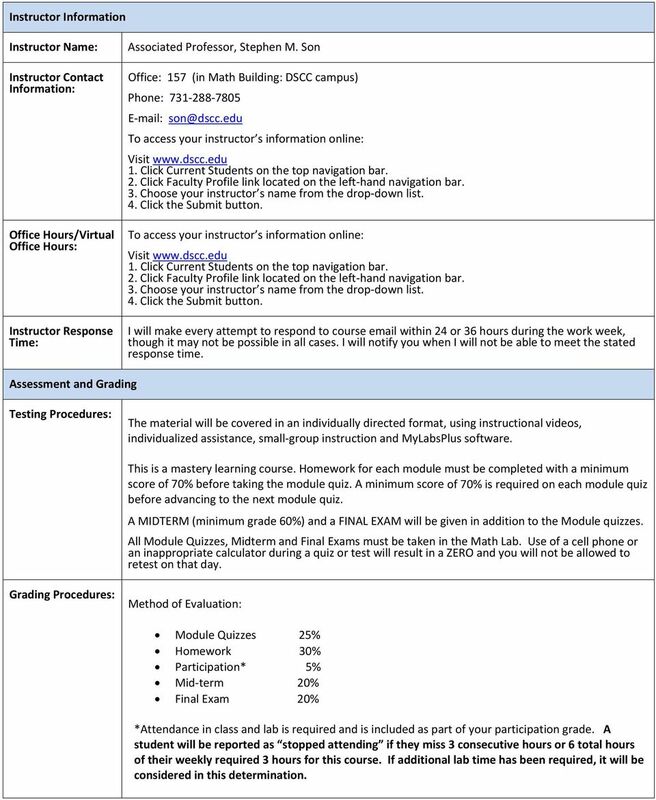 Assessment and Grading Testing Procedures: The material will be covered in an individually directed format, using instructional videos, individualized assistance, small group instruction and MyLabsPlus software. This is a mastery learning course. Homework for each module must be completed with a minimum score of 70% before taking the module quiz. A minimum score of 70% is required on each module quiz before advancing to the next module quiz. A MIDTERM (minimum grade 60%) and a FINAL EXAM will be given in addition to the Module quizzes. All Module Quizzes, Midterm and Final Exams must be taken in the Math Lab. Use of a cell phone or an inappropriate calculator during a quiz or test will result in a ZERO and you will not be allowed to retest on that day. Grading Procedures: Method of Evaluation: Module Quizzes 25% Homework 30% Participation* 5% Mid term 20% Final Exam 20% *Attendance in class and lab is required and is included as part of your participation grade. A student will be reported as stopped attending if they miss 3 consecutive hours or 6 total hours of their weekly required 3 hours for this course. If additional lab time has been required, it will be considered in this determination. 5 Class Participation: Course Ground Rules General: 1. Students must attend class at the assigned time each week. 2. Students must attend Math Lab a minimum of two hours each week. 3. Students must bring their portfolio/notebook with course materials, notes, and homework to class each week and Math Lab. 4. 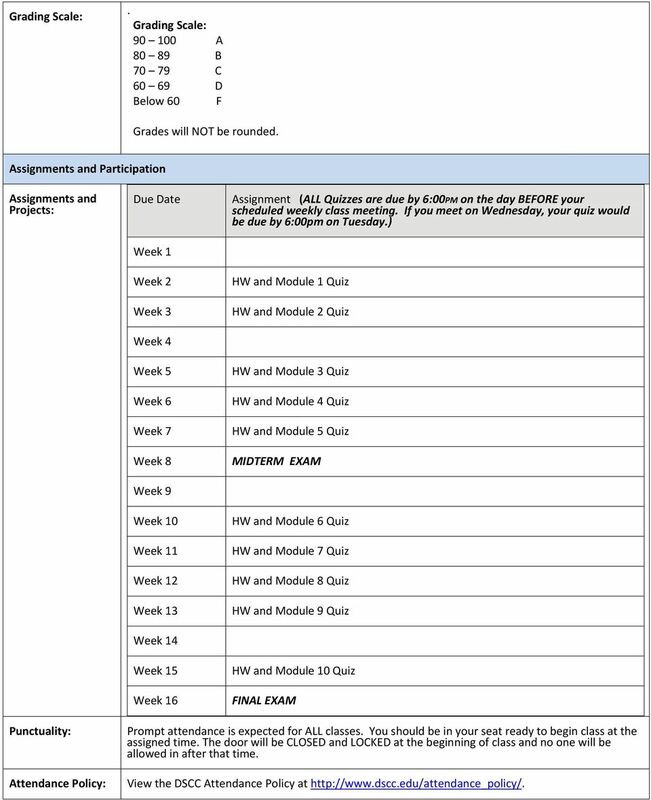 Students should stay on pace with assigned Module schedule to get maximum participation credit. 5. 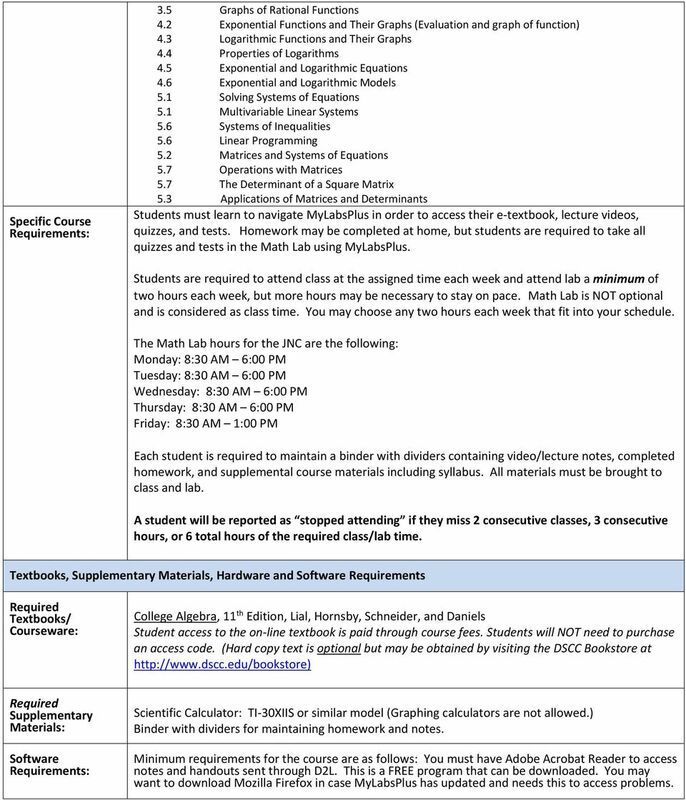 Additional Math Lab time will be required if student gets behind two modules or more. This additional required time will be considered when determining stopped attending. A student will be reported as stopped attending if he/she misses 2 consecutive classes, 3 consecutive hours, or 6 total hours of required class/lab time. 1. Participation is required. 2. A Syllabus Contract must be completed, signed, and turned in to the instructor no later than the second class period. 3. Know and abide by the rules of the MATH LAB. 4. Cell phones should be on silent and put away. Do not answer a call during class. If you leave class to take or make a call, you will not be allowed to re enter and will counted as absent for that class period. If you have an emergency, let instructor know in advance. Use of a cell phone in any way during a test or quiz will result in a ZERO and possible failure in the course. 5. Learn how to navigate within the course management system. 6. Keep abreast of course announcements. 7. Use the assigned college address as opposed to a personal address. 8. Address technical problems immediately. 9. Observe course netiquette at all times. 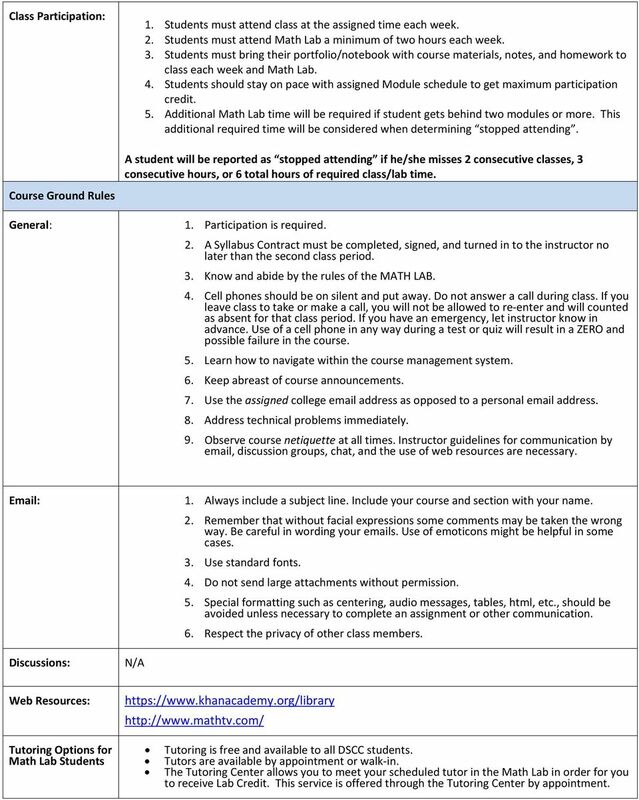 Instructor guidelines for communication by , discussion groups, chat, and the use of web resources are necessary. Discussions: N/A 1. Always include a subject line. Include your course and section with your name. 2. Remember that without facial expressions some comments may be taken the wrong way. Be careful in wording your s. Use of emoticons might be helpful in some cases. 3. Use standard fonts. 4. Do not send large attachments without permission. 5. Special formatting such as centering, audio messages, tables, html, etc., should be avoided unless necessary to complete an assignment or other communication. 6. Respect the privacy of other class members. Web Resources: Tutoring Options for Math Lab Students Tutoring is free and available to all DSCC students. Tutors are available by appointment or walk in. The Tutoring Center allows you to meet your scheduled tutor in the Math Lab in order for you to receive Lab Credit. This service is offered through the Tutoring Center by appointment. 6 Other Important Information Tutoring Resources Covington: The Tutoring Center at JNC is located in the Jimmy Naifeh Building, Room 157. Tutoring Center hours are posted on the door of the center. See Julie Hasuly, Tutor Center Coordinator, to make an appointment. Library Resources For the DSCC library or help desk visit To ask a question about books, interlibrary loans or other LRC information, call the LRC at For the Tennessee Virtual Library go to and click on TBR Virtual Library. Reporting Fraud, Waste, or Abuse Technical Assistance/Help Desk: Students With Disabilities: Syllabus Changes: Server Outage Disclaimer: Safety / Security Implementation date approved by Instructional Council: Report Fraud, Waste, and Abuse at For technical assistance, contact the DSCC Help Desk. Dyersburg Campus (731) Jimmy Naifeh Center (JNC) (901) Gibson County Center (GCC) (731) Visit the Help Desk on the web at for tutorials and other how to guides. You may also contact the Help Desk by at Dyersburg State Community College is committed to providing a discrimination free environment for all students. Students with disabilities are encouraged to inform the College of any assistance they may need. Please notify the ADA Coordinator at (731) From time to time during the semester, it may be necessary to make changes to the material in the course syllabus. Any necessary changes to the course syllabus will be sent to you by and posted within the online course material. 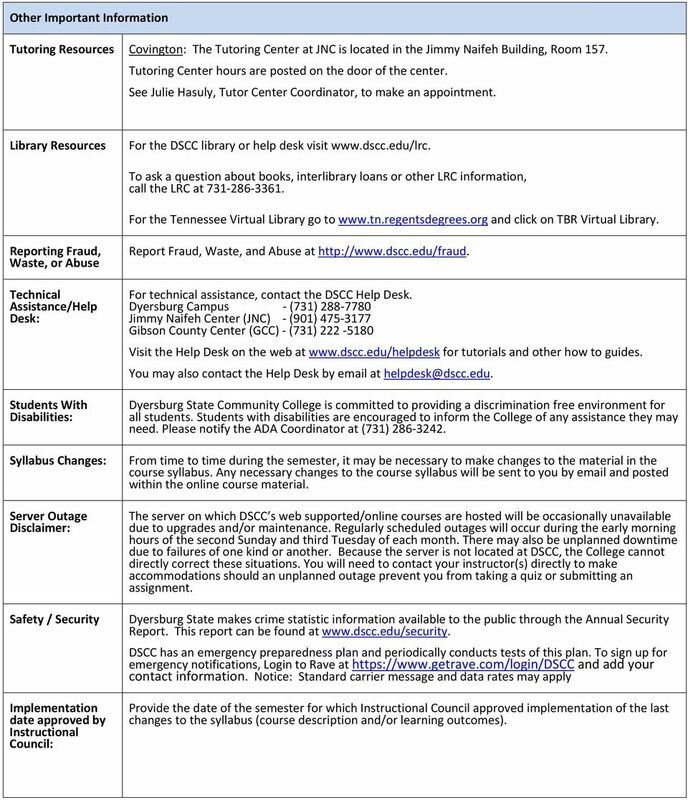 The server on which DSCC s web supported/online courses are hosted will be occasionally unavailable due to upgrades and/or maintenance. Regularly scheduled outages will occur during the early morning hours of the second Sunday and third Tuesday of each month. There may also be unplanned downtime due to failures of one kind or another. Because the server is not located at DSCC, the College cannot directly correct these situations. You will need to contact your instructor(s) directly to make accommodations should an unplanned outage prevent you from taking a quiz or submitting an assignment. Dyersburg State makes crime statistic information available to the public through the Annual Security Report. This report can be found at DSCC has an emergency preparedness plan and periodically conducts tests of this plan. To sign up for emergency notifications, Login to Rave at and add your contact information. Notice: Standard carrier message and data rates may apply Provide the date of the semester for which Instructional Council approved implementation of the last changes to the syllabus (course description and/or learning outcomes). Demonstrate familiarity with psychology theory. Describe research methods in psychology. Apply critical thinking skills in psychology. Social Psychology 2120 Online Course Syllabus Spring 2012 Semester. Apply psychology in day-to-day life. College Algebra. Syllabus MAT 101. What will I learn in this class? Required Course Materials. Contacting your instructor. How is this class taught?